Paint it black, and blue, red and white… That’s exactly what Amsterdam-based sign-writer and graphic designer, Shon Price, along with a collection of other artists from around the world have been doing for the Rolling Stones and Tommy Hilfiger using 1 Shot paints and Handover brushes – Painting three Rolling Stones logos onto 300 Tommy Hilfiger leather jackets! Having been contacted by Hilfiger Denim, for whom Shon had previously worked, The Rolling Stones were planning an exhibition entitled ‘Exhibitionism’, sponsored by Hilfiger Denim. 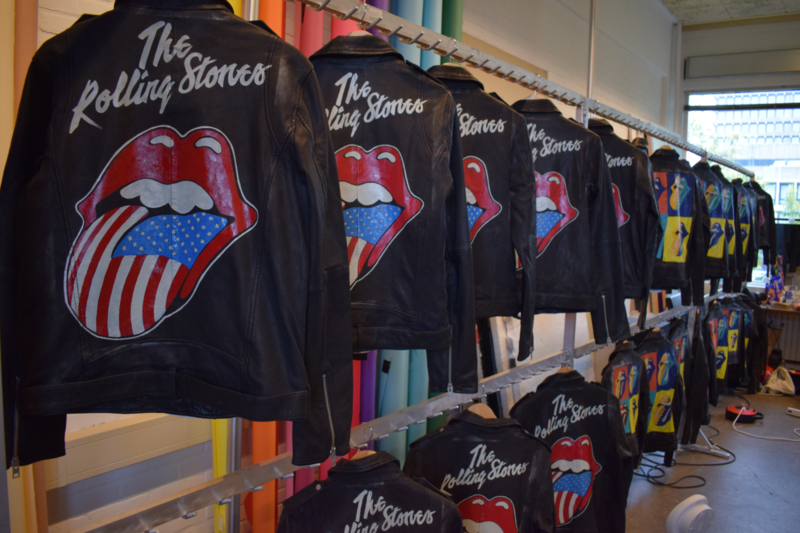 The fashion label was planning a line of clothing branded with Rolling Stones artworks to be sold in tandem throughout Hilfiger Denim stores and online. However, for the museum and shop, something more notable was requested: Hand-painted Hilfiger Denim Jackets, a job that Shon describes as a super-cool, dream job to which he ‘of course’ said yes. So, perhaps the sentiment behind ‘You Can’t Always Get What you Want’ doesn’t always ring so true! Opening in London, Shon initially picked three artworks for the Exhibitionism jackets from The Rolling Stones archive, painting some 40 jackets in three months. Destined to travel the world for 5 years, Exhibitionism’s next stop was New York and Hilfiger Denim contacted Shon, asking him if he could paint a staggering 300 jackets, required within just one month. With the job demanding a sizeable team of artists, Shon tapped the Amsterdam Letterheads meeting for talent and successfully developed a team of 13 artists from Amsterdam and the Netherlands, but as far and wide as the UK, Greece, Poland, Italy, Switzerland and even Australia. Locking themselves away in a studio, the International team of talented artists produced the 300 jackets in just 12 days. Do you have news of artwork projects you think others would like to read about? Pinstriping & Kustom Graphics Magazine is always looking for interesting features. Get in touch – Please email: studio@pandkg.com.